Who do you think the mysterious child that Casca found on the beach really is? *Some other spiritual entity thats taking the form og Guts' and Casca's ideal child. Actually, most of the speculation concerning the Mysterious Child took place in the episode thread where he first appeared. I'll look some more then, I was having a hard time finding anything. They didn't really talk about it much, but thanks for the link anyways. I think I am just gonna drop it because really its one of those things that will be explained later if they are important. That kid on the beach found by Casca... Now I might get smacked for asking this (I'm at work and can't check back any reference as of this moment) but was it a boy or a girl?? Is he/she...good or evil? Like it's possible it could be like a sleeper apostle like they can think he/she's harmless then BAM... Mass slaughter... Or i dunno maybe the lil kid is ok and on their side... Ah hell i dunno... Your thoughts! it a boy or a girl?? Is he/she...good or evil? It's a boy (the title of the episode where he appears being "The Boy in the Moonlight"), and he's apparently (and very probably) on the good side, since he helped Guts' band on a beach when they were most desperate. Considering what we saw of the character, it's difficult to say for sure though. I tend to go with the theory that it is Guts and Casca's child. The resemblance to young Guts is hard to write off. Also, Casca was immediately maternal towards him, and he did actually bring Casca and Guts into physical contact. Now assuming this theory is correct, then that raises a question. I believe Skull Knight said that the Demon Child was evil, but still longed to be with his parents. Now is the moonlight child still tainted by evil, or has the demonic influence left it after Griffith incarnated through him? I would guess the moonlight child was pure, since there was no longer anything demonic in his appearance, but the kid is still powerful. Bear in mind this is based on an assumption. Thoughts? I wouldn't take a stance on what is the child for now, apart from the fact that he is a "superior being", and will most probably prove to be a key character at some point later on. But going along or not with the theory of him being a materialization of the son of Guts and Casca (he does resemble them though), I think it is safe to say that he is "pure". Your points are valid, the only problem would be the behaviour of the new Griffith and what we have seen and taken for certain until now. If the kid is indeed the Demon Child, cleansed of the taint Femto had inflicted him while abusing Casca, then how come did Griffith protect her compulsively when Guts fought Zodd on the hill, and why did he think of the Demon Child (referring to his own feelings) then and while watching the fight? Or maybe the child, being still sentient inside of Griffith in spite of the situation, would be able to use Griffith's unearthly power on his behalf, especially near the sea, which has a very strong connexion to the astral world (not to mention the full moon). Casca does that with everything, doesn't she? Like I remember when playing the DC game she picked up that Mandragora baby I was like ewwww, and then she got the mandragora heart in a jar and was huggin' on it and I was like ew again. I think that tendency in Casca has to do with something in her knowing she was going to be a mom but that it was stolen from her (more reasons to be insane). Then again, her holding and picking up anything that is a baby or child-like could be more related to how she has regressed to the mindset of a little toddler. Toddler girls love their pretty dolls and are often fascinated by real babies all the more. Back on subject; I dont have a stance on the mysterious child anymore, I just decided it's best to wait for miura to do what he's going to do, and be happy with that. I have an idea, crazy as it may be. Perhaps the Mysterious Child is the result of Griffith shedding off any remaining part of the original demonic child inside him. This offshoot may have inherited some of Griffith's powers, as well. Just an idea, though. Quite an interesting thought indeed. I suppose it makes the child grow really fast too, or does it have control over what it forms into? Well, I'd love to say that it's just Griffith blaming the Demon Child for his own emotions, but that seems too convenient. Though that would be in keeping with Griffith's character to continue to deny his feelings in such a manner, there's enough evidence that it really is the Child's influence for me to stick to that. Even if Griffith solely took over the demonic aspects, those parts still recognize Guts and Casca as parents. Or maybe the child, being still sentient inside of Griffith in spite of the situation, would be able to use Griffith's unearthly power on his behalf, especially near the sea, which has a very strong connexion to the astral world (not to mention the full moon).. I believe they're seperate entities now. Besides, the Demon Child was already powerful before Griffith's incarnation. Well it's a plausible possibility, even if I wonder how he'd be able to do that. Well, I'd love to say that it's just Griffith blaming the Demon Child for his own emotions, but that seems too convenient. Yeah, it would make things easier, but I really don't buy it. Even if Griffith solely took over the demonic aspects, those parts still recognize Guts and Casca as parents. That eventuality seems a bit far-fetched to me, though. Besides, the Demon Child was already powerful before Griffith's incarnation. Yes, but that powerful? To the point of being "superior"? I'll like to bring the moon child back into play. We haven't seen or heard from him for awhile, even though in Berserk it's only been a few weeks perhaps. But what do you think he is up to now? And what kind of powers (if any) do you think he has? Well thinking about it real quick... I think we will see him again when Guts and co. fianlly get ship bound... its probably a loooooong trip to Elfhelm and who knows... maybe he will guide them there. Yeah, I don't think it will show up again anytime soon. I'd say after they arrive on Skellig Island. I've imagined that this child would have similar abilities to that of the current Griffith (i.e. nothing that would be readily apparent outside of appearing as a sort of astral being). Yeah, I don't think it will show up again anytime soon. I third that. I don't think we'll learn more about him until later in the story, I see him as a middle and long term element in the plot, not a short term one. Well, we haven't got much information on his powers/status for now but we do know that he's a "superior being", even though that's pretty vague. I think it's still a bit early to make comparisons with Griffith (although I've done it myself in Speculation Nation ) since we also ignore the extent of Griffith's powers, but I think we can all agree that he's obviously in the big league and will eventually play an important role. If the kid is indeed the Demon Child, cleansed of the taint Femto had inflicted him while abusing Casca, then how come did Griffith protect her compulsively when Guts fought Zodd on the hill, and why did he think of the Demon Child (referring to his own feelings) then and while watching the fight? Going with what someone already mentioned. This may be too Inu-Yashey (which is nothing to be proud of) but I'm partial to the theory of Griffith having recently shedded the part of him that was the child. Maybe keeping the evil aspects, and losing any troublesome baggage from the childs mind. I'm not sure how he would do that exactly, but he's one of the Godhand so he can do whatever he wants. Right? Interesting idea, but I can't really picture Griff wanting to do something like that. As the kind of guy that would go taunt Guts just to see what it would do to him, Griff seems interested, almost in a detached way, in whatever little conflict is left in him after being Femto. I doubt he'd go carve it out of himself. Course now I said that, it'll turn out that's exactly what Moonbaby is. Well, it's explicitly stated that his father was Guts. And the Demon Child regarded him as such (haunting him and all), which is also the reason Griffith felt something when he watched him fight with Zodd. Femto corrupted the embryo, that's all. Interesting idea, but I can't really picture Griff wanting to do something like that. Me neither. But rather than thinking he wouldn't want to, I think he just can't. The Demon Child is the vessel he was incarnated in, I think it became an integral part of him at that time. And the fact we were shown these remnants of the Demon Child influencing his decisions makes the idea of "shedding" that part off even less likely to me (it would seem a bit superfluous if it was the case). Well, I'm reviving this thread (and double posting, which you won't see often) with something I never paid attention to until today and that I think could be a scoop. Of course, it remains speculation for now so don't take it as a verified fact. 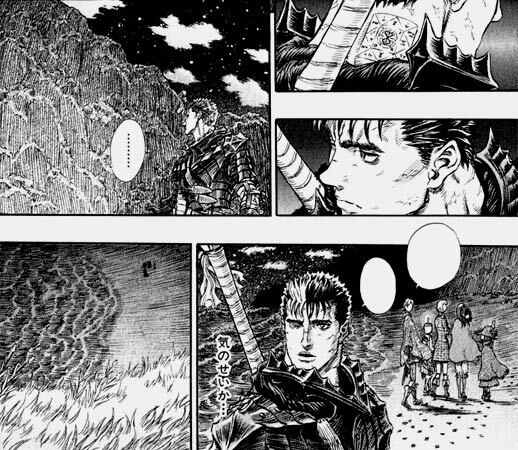 As you guys may or may not know, Miura added a page in volume 28 like he often does; this page is in episode 238, when the group is on the beach and right after they found the Moonlight Boy. I will post the part of this page that interests us below. Doesn't it remind you of somebody? Yeah. I could find a better shot but you get the idea. And what this implies is pretty clear: The Moonlight Boy = Griffith. Of course, Zodd could have only been there on his own to spy on the group, but does that sound likely? Not much to me. The boy even got on the cliff when he disappeared, it can't possibly be a coincidence. And it fits with the fact Griffith felt the Demon Child's feelings inside of him. From that point on the speculations can go in every direction: the boy could have momentarily taken control of Griffith, or Griffith could have consciously done it, maybe out of guilt, maybe because he felt like being a family, etc. He could have a split-personality now. Or maybe the change in him was a lot bigger than we thought. Maybe the so-called "remnants" are an integral and vital part of him. And he can change his appearance too. I do think it was the boy's side in control at the time if that whole theory were to be true. And that'd also mean he can suppress the effects of his power on the Brand. Remember when he looked at that crocodile in the hut? Or when he repulsed Guts effortlessly? And yet nobody (well, neither Schierke nor Guts) noticed anything peculiarly odd with him, just a strange Od but nothing more precise. That's the power of a member of the God Hand. It also adds a whole new dimension to Griffith's character, perfectly following what Miura introduced in volume 22. I can't help but marvel at how vicious leaving these clues is though, yet I just love it. So logical and obvious too, right under our noses all along. All it takes is to pay attention, let this be a lesson to everybody. 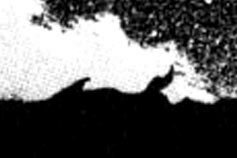 And to me it even feels like Miura thought while compiling volume 28: "Bah, they'll never find out if I don't leave a bigger clue... *sigh* Ok, let's go for a big obvious one with a new page."